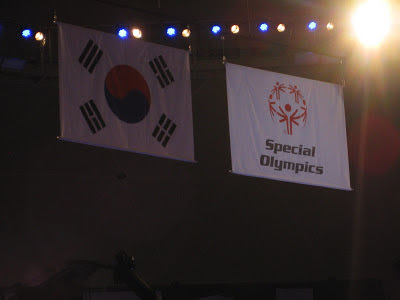 A year and twenty-one days ago I was in South Korea watching Alex represent the United States of America in the World Winter Special Olympic Games. 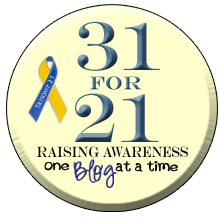 In honor of this life changing experience and this year Winter's Olympics in Sochi, Russia I am going to republish the posts about the Olympics. SOG - The Opening Ceremonies - "Together We Can!" I started to write this post the evening of the Opening Ceremonies and then realized I would not be able to do it justice. It is now seven nights past the Opening Ceremonies and one night from the Closing ceremonies, and I still cannot do it justice. Imagine that people of all color and creed are gathered together to represent their countries with honor and pride. Imagine these 3,000 plus athlete all having disabilities. Imagine every single one of these proud athletes is respected for who they are and what they contribute to their communities, to their countries and to the world…..This is the Special Olympic World Games. But after much thought I realized those simple words cannot express what is really happening these nine days in the Republic of Korea. Following is an excerpt from the Opening Ceremonies Speech of Na Kyung Won, the Chair of the Special Olympics World Winter Games (who was also kind enough to allow our picture to be taken with her). “Not just in Korea, but in many places around the world, prejudice and discrimination against the handicapped continues to take place, preventing them from demonstrating their full potential. Over the next eight days, these unique athletes will reveal their surprising abilities which have been hidden under the dark cloud of discrimination….. 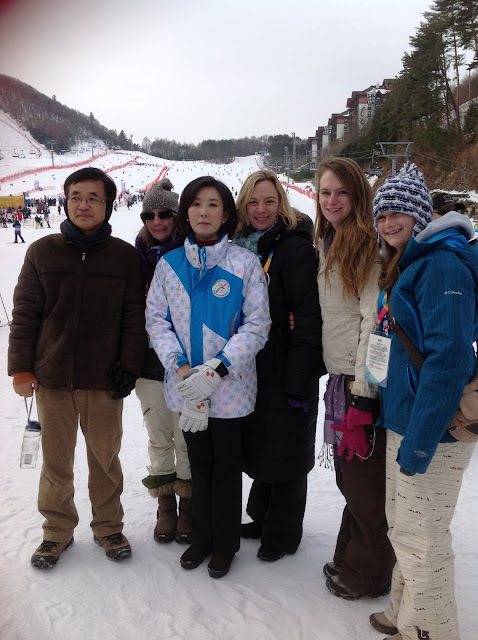 The Korean people are gracious and welcoming. They are proud of their heritage and the progress they have made in the world since the 38th parallel was established in 1953, permanently dividing Korea into two countries. 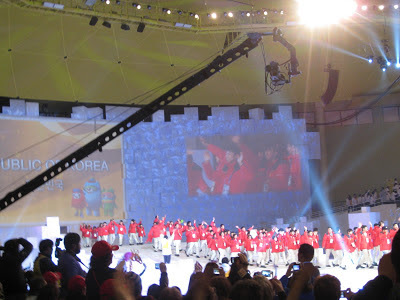 We have been treated to many Korean rituals and performances, all fore shadowed at the Opening Ceremonies. Family members were allotted two tickets to the Opening Ceremonies, so only Courtney and I were able to attend (we are also traveling with my sister Sue and her daughter Kelsey). It was a beautiful ceremony which included the traditional parade of athletes, with the US one of the largest delegations. There were speeches by people with and without disabilities, including the President of Korea Lee Myung-bak will relinquish his post in February to I was able to see the President up close as I was detained by his security force when I tried to get to the ladies room. 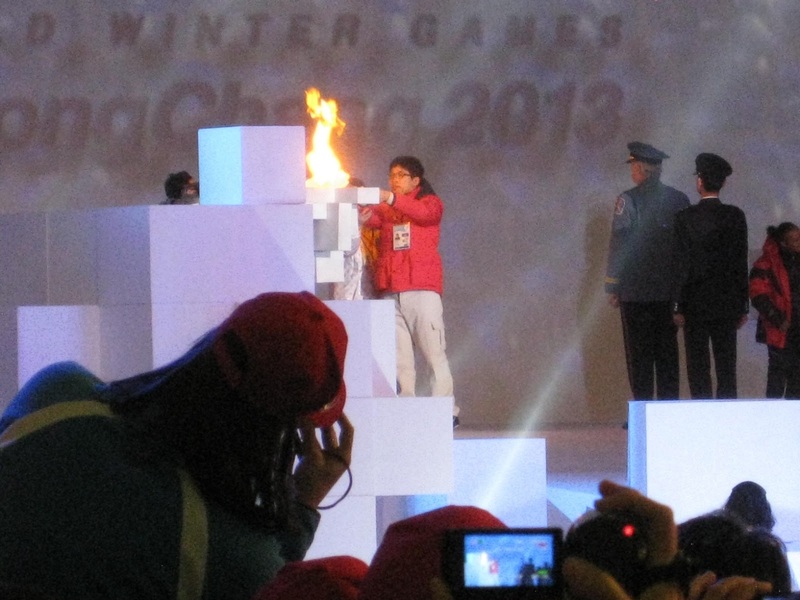 The final act was the lighting of the Olympic Torch, which had been carried all the way from Greece, the home of the last World Summer Olympics. These seven days following the Opening Ceremoies have given me renewed hope that people of all abilities can and will be accepted in their communities, their countries and the world. Every athlete here is respected for who they are, not what they have. Each athlete goes out every day in cold, rain and snow to compete to the best of their abilities and are making a difference for people all over the world. The media coverage has been outstanding and the successes of all the athletes highlighted over and over again. This is what I have experienced here in South Korea, inclusion, acceptance and equality. And this is what is so hard to put into words, it all seems so “normal” here, not abnormal at all. As an aside, I have loved meeting athletes with down syndrome from across the world, Russia. Serbia, Ireland and even some of the African nations. 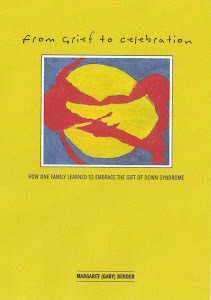 Down syndrome does not discriminate by color, creed or nationality and it makes me feel so connected to our world. And a special shout-out to our self-less American coaches, administrators and volunteers who have changed the course of my daughter’s life is so many positive ways.